The retailer will start selling roasted crickets – described as “crunchy in texture with a rich smoky flavour” – in 250 of its stores from Monday, capitalising on the growing prominence of bush tucker in the global warming debate. The damaging environmental impact of global meat production has spurred interest in bugs – which can be bred in significant numbers without taking up large amounts of land, water or feed – as an alternative, sustainable food source. The packaging for the crunchy crickets, made by London-based Eat Grub, deploys the environmental argument in a bid to win over shoppers who might balk at bugs for lunch. The new product is trumpeted by its manufacturer as “more sustainable than pork scratchings … and more exciting than a crisp”. The Eat Grub bugs – acheta domesticus, or house crickets – are farmed in Europe and come in packets of about 50, at £1.50 per bag. If shoppers can get over the ick factor, they can consume the crickets as a snack or as a garnish for noodles, soups and salads. The global edible insect market is set to exceed $520m (£406m) by 2023,according to recent research. The UN Food and Agriculture Organization says at least 2 billion people regularly consume insects, and the tiny creatures could also help meet the food needs of the world’s growing population. More than 1,000 insect species are eaten around the world but hardly feature in the diets of many rich nations. In the UK, crickets and other insects have so far been predominantly limited to quirky pop-ups or sales through online outlets, while they also feature on a few restaurant menus. The move by Sainsbury’s means this is the first time consumers will be able to buy insects from a supermarket. Insects are naturally very low in calories and suitable for gluten- and dairy-free diets, as well as being exceptionally high in protein. Gram for gram, dried crickets contain more protein than beef, chicken and pork – with 100g containing 68g of protein, compared with only 31g of protein in beef. The food group also tops the list when it comes to sustainability. Bugs emit considerably lower levels of greenhouse gases than most livestock and are more efficient in terms of the resources needed to farm them – crickets, for example, need 12 times less feed than cattle. Other retailers are capitalising on the rise of insect food. The online grocer Ocado sells Eat Grub’s protein bars made of cricket powder, while the French supermarket group Carrefour has started selling bug-based products from the Jimini’s range in more than 300 of its branches in Spain. The products include spicy chilli buffalo worms and insect-based energy bars, pasta and granola. 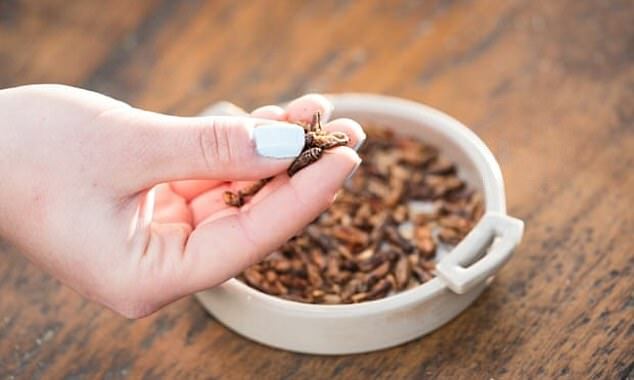 The UK department store Selfridges, which also sells some of Jimini’s products, will next February launch a pop-up “Bug Bar” selling a range of products including cricket flour while introducing shoppers to new recipes. The specialist food shops Fortnum & Mason and Planet Organic also stock the Jimini’s range. Chefs report some success in encouraging their diners to tuck into creepy-crawlies. Archipelago restaurant in central London has cricket and locusts on its menu, bought in bulk frozen from a supplier on the Isle of Wight.